Why do you have lower back pain? No doubt you have asked yourself this question time and time again. When you wake up in the morning and you take those first few agonizing steps, it’s likely that you reminisce about a time not too long ago when lower back pain was not a part of your life. And so, you wonder, what changed? Why is this happening to me? While everyone’s lower back pain symptoms are unique, there are some characteristics that most lower back pain sufferers share in common. There are a lot of reasons why you may be experiencing lower back pain. If you are in your 30’s, 40’s, or 50’s, it is likely that your chronic lower back pain is associated with a sprained muscle, a herniated disc, or degenerative disc disease.Maybe you can trace the start of your lower back pain to an accident or to a time when you attempted to lift a heavy object, twisted your body in an awkward position, and from that moment on there was pain. Lower back pain can range in severity. There may be some mornings when you wake up and the pain is just a mild annoyance. Then there are other days, maybe after sitting at your desk for hours on end, that you attempt to stand and the pain is so intense that you drop back down into your seat. Lower back pain often starts with a dull aching in your lower back. Over the course of days, depending on the reason for the pain, you may start to feel symptoms in your buttocks and down your leg. Things like walking and bending over become increasingly difficult. Days and weeks passed and the situation did not get better. You go from feeling hopeful that you’re going to be back to your old self to fearing that back pain is now your new norm. You may visit chiropractors, back surgeons, and other medical professionals hoping to find relief to your pain. But time and time again, you are left feeling frustrated as the therapies they prescribe only provide minimal relief or provide no relief at all. Slowly, you realize that barring a miracle, you may be spending the rest of your life dealing with this pain. 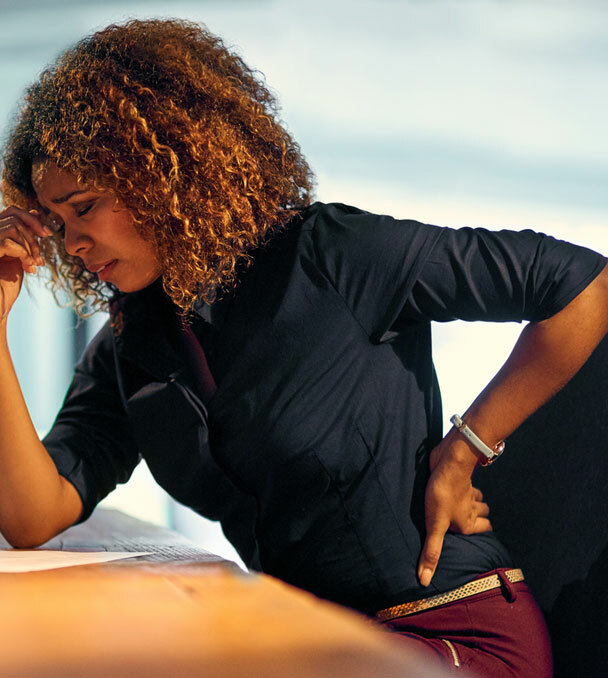 If your lower back pain is the result of a herniated disc or certain types of muscle damage, your doctor may have told you that you are experiencing sciatica. Sciatica pain is the result of the nerve root in the lower spine being compressed. For this reason, the pain travels along the entire nerve from the buttocks to the feet. Another major culprit for lower back pain is degenerative disc disease. This disease does not respect age, and it can start when a person is as young as 20. If you’re dealing with this, it’s because the discs between your vertebrae have started to break down. As a result, your discs become inflamed, and your lower back becomes unstable. This in turn affects the nerves, muscles, and other structures in your lower back, leading to severe pain. Your back and your spine are part of the most complicated system in your body. Because of this, it can be damaged in several ways and result in pain. Regardless of why you have lower back pain, the results are the same. Loss of mobility, loss of strength, loss of flexibility, and a diminished quality of life. Many lower back pain sufferers visit doctor after doctor and get no results. If this is true in your case, you may feel like medical professionals have given up on you. That may be true for them, but it’s not true for us. We understand that your pain is real and that it is seriously affecting the quality of your life. For this reason, we will never give up on you. We will work with you until we can help you manage your pain. The first step is the initial consultation. During the initial consultation, our goal is to understand you and the unique pain that you are dealing with. Once we have this information, we can work with you to create an individualized program for addressing your lower back pain. This program includes finding a possible short term solution to your pain as well as a long-term solution. Our goal is to help you get back to living your life. Lower back pain has robbed you of enough joy. It’s time for you to start living a pain-free life again.